Spent last weekend south of Seattle visiting family, got the chance on Sunday to go for a long ride along the Foothills Trail in some really nice cool & sunny weather. It was my first time riding in the area. Getting to the trail was pretty much as expected as far as riding in the "far suburbs"; plenty of broken and uneven road surface, very little shoulder (and what shoulder there was, is full of gravel and debris), and impatient drivers going fast and leaving very little space. I was glad to have my Bontrager Flare R tail light with its 65 Lumens flash mode, I'm not a timid road user by any means but it gives me a little more confidence in these kinds of conditions. Once I descended from South Hill into the valley and got on the actual Foothills Trail at Shaw Rd & Pioneer Way, it was great. It's a fully separated and paved bike path (with joggers and walkers as well), about 2-3 meters wide. It's flat and smooth, with almost no bumpy sections from root growth that you find on some other trails. There are hardly any intersections, although the ones there are, the cars often have right-of-way with no stop signs. Even without the stop signs, the local drivers would almost always slow down and wave me through, a much more relaxed rural atmosphere than the hectic suburban pace just up the hill. The Foothills Trail sits atop a historic railroad bed and snakes through the river valley southeast of Tacoma. This 25-mile-long trail is a popular commuter route and recreational destination for bicyclists, while hikers enjoy shorter, more manageable segments of the trail. One of the most scenic sections for the unobstructed views of nearby Mt. Rainier begins in Orting and follows the Carbon River upstream through farmland and forest. The Foothills Trail is a 12-foot wide non-motorized asphalt trail / linear park suitable for bicycles, walking, in-line skates and wheel chairs. It also has a soft shoulder path for equestrians. Completed paved sections include 15 miles from Meeker to the South Prairie Creek in South Prairie and a 2 mile section in Buckley. Our future plan is to continue the trail to Puyallup where it connects with the Riverwalk Trail then ultimately to Tacoma and Sumner where we will connect with the Interurban Trail that now extends through Kent and Auburn. 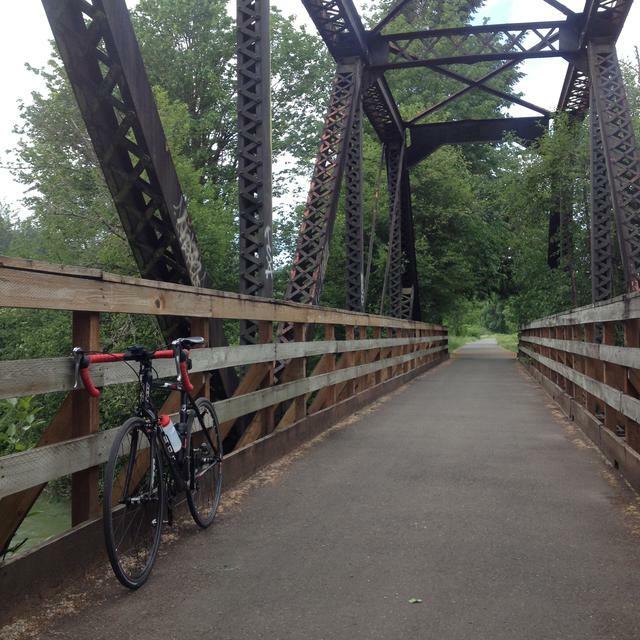 The trail in Buckley will continue east to King County and Enumclaw. The Foothills Trail has been constructed in sections as finances, environmental permits and county ownership have allowed. When complete, the trail will be more than 28 miles in length. June 28, 2007 marked the opening of the entire length of the Foothills Trail, extending from Buckley through the Town of South Prairie, City of Orting and into the City of Puyallup. I saw about 100 trail users on the way up and down the entire trail on a Sunday, so it seems to get pretty good use in its current condition. There were a lot of families on bicycles, who I assume drove to one of the parking areas next to the trail, as the description above indicates, it's unfortunately not well connected to a larger bike trail system. 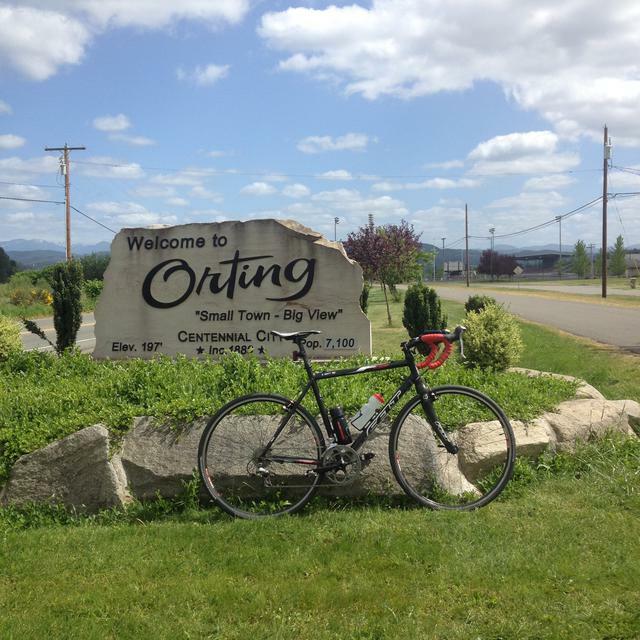 Orting, South Prairie, and Buckley all have the usual gas stations and other services. The only bike shop I saw was in Orting, but it was surprisingly closed on Sundays. The only business I saw with a trail-facing area was a coffee shack in South Prairie, although I saw several restaurants with signs saying "cyclists welcome". I was carrying a full set of spares and tools and would recommend the same. There's some great views of Mt. Rainier from the bike path at Orting and beyond, but unfortunately on this day it was mostly obscured by clouds so I didn't get any good photos. The trail abruptly ends at a river on the east side of South Prairie, so I got on Pioneer Way (SR 162) and rode that to the town of Buckley (on the way back, I discovered their paved 2 mile section of bike path, which isn't connected to the rest). The reason I rode to Buckley was to ride the Mud Mountain Road loop, which I discovered from the Strava Labs Heatmap (very handy) was a popular route. Not sure if it's popular because it's pretty, quiet, and a good workout, or if there's some event that happens there, but I was very happy with the choice. The road surface is great, the farms are pretty, it's a nice winding road with some short climbs that are just long enough to be a fun workout. 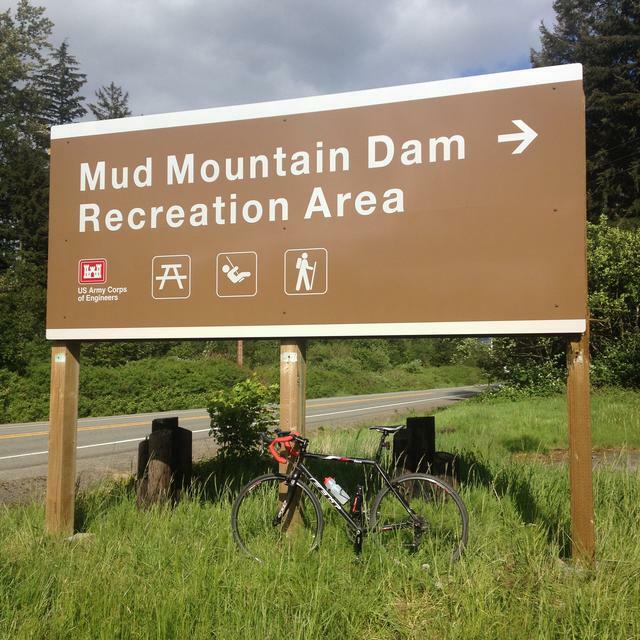 I didn't see the Mud Mountain Dam, either I missed the signs or it's not visible from the road. The descent on Enumclaw Chinook Pass Rd (SR 410) required some concentration, it is a fast road (like other State Routes) and there was a lot of gravel and sand on the shoulder. There were some pretty good winds coming down from the mountain, and even though the sun was hot the wind had more than a little glacial cooling. I was very glad to have my arm warmers to put on, and I would have preferred to have a mid-weight jersey instead of the summer-weight jersey I chose. Upon returning to Orting, I took the Kapowsin Road to 200th St to return to South Hill, which I don't recommend. The road was very rough, no shoulder, and fast drivers. Next time I'll try returning on Military Rd instead. Well, that's my ride report, hope someone finds it useful. Any questions, just post a reply below.